Having a well-maintained parking lot speaks volumes for the image of your business but keeping it in tip-top condition during the rainy winter months can present a challenge if you don’t take the proper steps and plan ahead. If your parking lot has numerous potholes, this can cause traffic flow issues, pedestrian hazards, and frustrated customers. Failing to provide the proper maintenance to your parking lot can have a direct effect on business. Customers may choose to park elsewhere and potentially shop at a competitor instead. While Southern California winters bring more rain than freezing temperatures, the effects of water damage can still be detrimental for asphalt. Water can get absorbed into the asphalt, which can lead to crumbling that will break down the pavement and create even larger potholes. At the very first sign of a pothole, it is important to get it filled immediately to prevent further (and more expensive) parking lot repair issues. It will be significantly less expensive to repair one pothole than the cost of repairing several yards of parking lot. With the SoCal rainy season running sporadically from November through March, the heaviest rainfall tends to be in the month of February. It’s still not too late to tackle any existing potholes in December to be prepared for heavier rainfall in the spring. While most paving companies would like to be able to complete jobs during any weather conditions, asphalt is made of a mixture that contains oils that repel water, making the laying process difficult on a rainy day. Potholes can be a sign of a far more serious problem such as damaged underground pipes and cables. Underground damage can weaken the upper surface layer which results in a pothole formation. 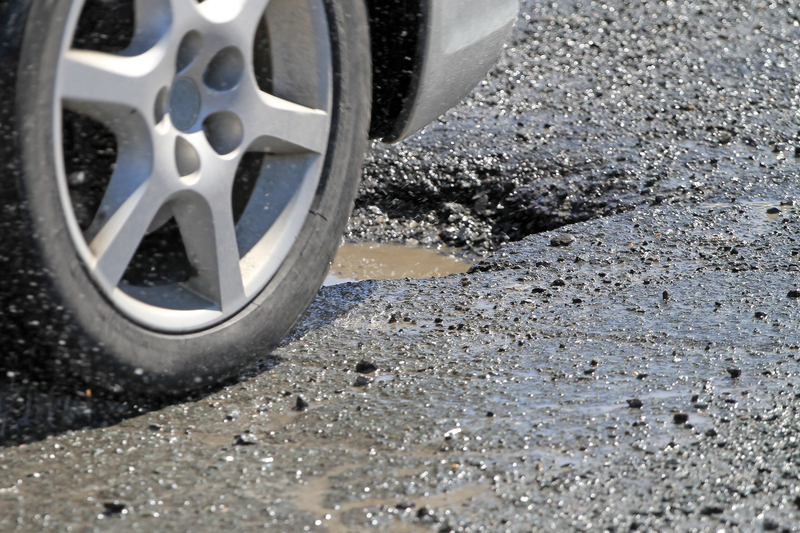 Simply patching up the pothole will not offer a permanent solution if there is any underlying damage. The initial cause will still persist and could result in the entire area caving in, potentially causing damage to both property and life. Prior to doing any pothole repair it is important to have your contractor check for these type of damages. Designed to stop weather damage, Slurry Seal is a seal coating which will cut down on the wear and tear and will also resist oil, gas, and reduce the overall cost of parking lot maintenance. To ensure your parking lot stays safe this winter season, it’s best to hire a trusted asphalt maintenance company to survey your lot for existing damage and provide you with the best options for repair and preventative solutions. Contact Curcio Enterprises, Inc. today to tackle any current parking lot issues and learn more about the Slurry Seal coating treatment. In business since 1975, our dependable, licensed team is here to serve your every parking maintenance needs.